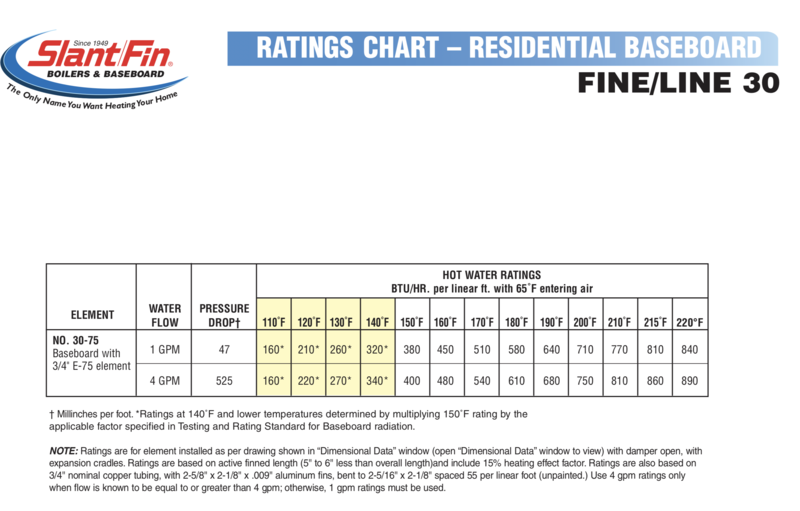 I'm looking at hydronic baseboard heat for new construction. Runtal is much more expensive per BTU than Slantfin but Runtal is mainly radiative while Slantfin mainly convective. I understand that you're more comfortable with radiative heat (which mainly heats you) at lower temps than needed for convective heat (which heats the air and then the air heats you). Is there a rule of thumb that says something like "if you need X feet of Slantfin you'd only need Y feet of Runtal"? Also, is Runtal quieter (less ticking) than Slantfin? Thanks! The btu output per foot is the number you want to use. Most show output at various SWT and flow rates. Ideally you have a BTU load for each room or area served by the emitter. Also, many panel radiators are both convective and radiant emitters. Thank you. I know I need the BTU load per room and am getting that. I looked briefly at panels, but they seemed to take up lots of wall space compared to similar BTUs from baseboards which are more out of the way. Runtal UF-2 8' is 4800 btu or 600btuh/ft while Slantfin 8' unit is also 600 btu/ft so that seems the same (but the price is not the same!). Suppose I know BTU for a room, how do I decide if Slantfin (mainly convective) or Runtal (mainly radiative) gives best bang for buck? Am I off-track, my current understanding is that with radiative you could use less because it mainly heats you while convective heats the air and then you? Hence my question about rule of thumb to convert between runtal and slantfin. Or maybe I should just ask the general question: pros/cons of runtal versus slantfin? IMO -- Runtal is about looks. You can get various designs with higher outputs as well as towel racks. Have mostly used it in retrofit situations where I added radiant to an old house and needed small supplemental heat in a particular room. Have used it vertically in an outside corner. It's expensive ... have you thought about Buderus type panel radiators? I have done a couple projects using them -- Came in many sizes and outputs pithing sizes, -- they work very well and are easy to PEX together off of a manifold using the single pipe diverter valve. They work great with outdoor reset .. can be installed with individual thermo heads. I found them to be like a properly placed mini split .. you notice when they go in .. but no one else really does. I think the decision would be based on looks and cost, either will be comfortable and efficiency on par. If you are considering the low baseboard style Runtal, typically you would not be standing in front of them experiencing the radiant effect. I think the metal gauge, and maybe the finish the Runtal would be better. Ted: you need to look at the numbers posted for average Slant Fin, or any other type of baseboard units. Usually the BTU output is at 160F or 180F. In general, people are trying to use lower temperatures, because it is more efficient, and it doesn't set up as many in room convection loops . Low, slow heat is best. The Runtals, and other panel radiators contribute heat in both manners. Runtal (and all others) post the temperature at which they rate their claimed output. That is what Rod is saying. You need to compare apples to apples. The Runtal units are considerably nicer , and better built than Slant Fin. They cost a lot more too. But they are less likely to suffer damage form being kicked, or run into with vacuum cleaners. What I do is try to put the largest Runtal that will fit in a particular space. Like a UF-3 or UF-4 for example. The units with more panels put out slightly more heat than one with say one less panel, but a bit longer. Personally, I like the 60" UF-4 as a nice size. I just bought a Beacon Morris unit from Pex Universe. It is a much more affordable unit than the Runtal, and is offered in different thicknesses for different output. It was delivered in a very timely manner, and was very well packed. I plan to run it at 120-130F, so I got a thicker unit that allows more BTU per foot. I'm going to buy a bunch more now. They are of European manufacture. I have not heard any of these units tick, like the baseboard style units tend to. The Beacon Morris are the Buderus style. They come in single and double thickness/output. You can buy the bypass valves for them as well as the thermo head. The larger singles under a window work very well. Many thanks. I wanted to use hydronic because I lived in Europe for a number of years where it's standard, and I found it to be quiet (no ticking) and delivered a nice heat. Am not a fan of forced hot air. I've got a plumber who was going to look into this, i.e. SlantFin versus Runtal or Buderus for my new house, but apparently he's had some personal issues and hasn't. Now it's time to decide asap on the heating system and he's not providing much help. I've got a technical background but not in this stuff. I'm gathering that SlantFin wouldn't be a bad choice? IOW, the European units might have some advantages (looks, durability, conceivably more efficient) but that you pay a heck of a lot for that. Do I have that about right? How about noise, do SlantFins tick or knock? Thanks much for all the input! Properly installed fin tube should not tick, or make any noise. Tube expands as it warms and you need to allow space for that movement. SlantFin has nice sliders to prevent the squeak from element to hanger. Any tube thru the floor needs a large hole with noise insulator around it. Limit wide SWT temperature swings by using outdoor reset controls to keep temperatures eve, and avoid wide SWT swings to the fin tube. I have a 6' Runtal UF2 in our bathroom. It's very quiet, very radiant. Our boiler is set at 180F, The Runtal get's quite hot, maybe too hot as a thermometer reads 126 or a bit higher when placed on top in the middle. Ours is piped 1/2' but you can special order 3/4" if you want. The nice thing about the panel radiators is they can all be individually controlled. I have mine set up running off the hottest zone -- outdoor reset high mass boiler: the hottest zone is basically acting as the primary. So each loop off the manifold goes to a room -- most rooms have two radiators (under windows) .... third rad in the bathroom. Each radiator uses the bypass valve -- you set the Thermovalve on the unit. So it's simple single PEX to each unit between units and back to manifold return. Turn the knob on the radiator to set the room temp. The bypass fitting and the thermovalve add about $100 to the cost of the panel. but its all set up to add them. It's very comfortable .. size the units based on water temp. The Runtals need to be single on a zone or you need to add the bypass in the piping ... on the towels I usually like to do a zone vale and wall thermostat .. but you can add the fitting and the thermovalve. TAG: How do you like the TRV's? Have they been reliable for you? Instead of using the bypass valve, I was planning on home runs back to the distribution manifold to allow for individual control, without a TRV. The Beacon-Morris units look a lot like both Buderus, Myson, DiaNorm, Purmo-Radsen, etc. The box says Brugman, part of the Vasco Group. Very nicely made. If they work as well as they look I'm going to be a happy camper. TAG: Thank you for your comments. The unit I bought have a compression adapter ( $12 per pair) to use 1/2" copper pipe. Since most of the units I will use are in rooms above a crawlspace, I planned to simply run the copper pipe straight through the floor, and then sweat on an adapter to go to Pex A. (Uponor) I've only purchased one unit so far, to evaluate how I like it. I'd prefer to use one of the angled or straight radiator fittings, which have 1/2" NPT. At the time I ordered, they were not selling those yet. For the most part, the European panel units seem to use common valves. The brand fittings they sell are Oventrop, which is a well respected brand. Yes -- Oventrop ... That's the valve. Good price on the adapter for $12. I did have a few panels where I had to used the straight valves. It was places where I had removed a ceiling below but did not gut the rooms where the radiator went. I ended up taking the PEX straight into the valve .. I figured it was beer to have the exposed PEX vs a hurried splice in the ceiling. With crawl space available the splice is valid. Although they use PEX in Europe that way all the time -- I have had no issues. Buderus did make a plastic cover for the straight PEX -- but they were really cheap and I only bought one. OP... have you considered cast iron baseboard like Burnham Baseray or GOV-Board? It's similar BTU output compared to fin-tube... but it's more radiant (so you "feel" the heat) and it heats and cools slowly and gently like old school radiators that made old homes so comfortable. I have a mix of std fin-tube, some Smiths Heating Edge2 low temp baseboard and some cast iron baseboard (GOV-Board). By far the cast iron BB is everyone's favorite comfort wise.